1. Glycolysis, which yields a modest amount of energy, but results in a conversion of glucose into 2 molecules of pyruvate. 2. Pyruvate phosphorylation and the Krebs cycle, which completely oxidise pyruvate providing further energy and the “fuel” for electron transfer. 3. Oxidative phosphorylation, during which the electron transfer chain builds up the proton gradient across the inner mitochondrial membrane, and uses the proton-motive force to power ATP synthase to produce ATP. During the energy investment stage, 2 molecules of ATP are spent to power 2 reactions, each adding one phosphate group to glucose. 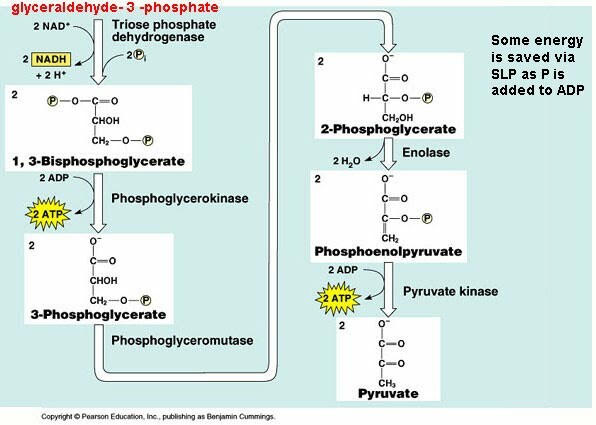 The resulting frucose-1,6-bisphosphate is then cleaved by the enzyme aldolase into two 3-carbon sugar isomers each containing one phosphate group, glyceraldehyde-3-phosphte and dihydroxyacetone phosphate. 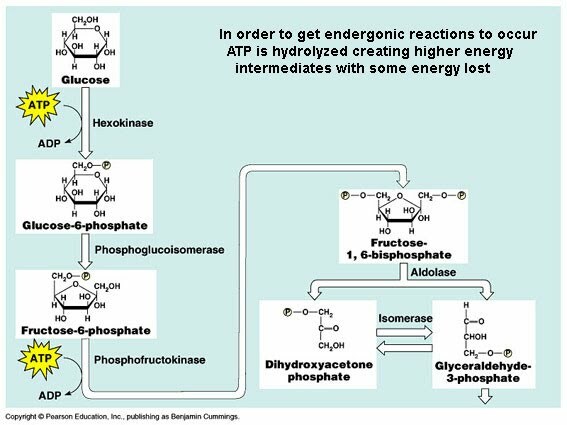 The latter of the two is converted into the former by the enzyme isomerase, and two molecules of glyceraldehydes-3-phosphate enter the second stage of glycolysis, the energy yielding phase. During the energy yielding stage (all the molecules in this stage have the coefficient two, since there are two molecules of sugar), the sugar is oxydised via electron transfer to NAD+, an exothermic reaction coupled with a subsequent phosphorylation of the sugar. This phosphate group is transferred to the ATP in the next step, yielding one molecule of ATP per one molecule of sugar via substrate-level phosphorylation (SLP). After extracting water from the remaining molecule, phosphoenolpyruvate, a compound high in potential energy, is created. ATP is then released (again, 1molecule of ATP per one molecule of sugar) by substrate-level phosphorylation of PEP, a reaction catalysed by pyruvate kinase, and pyruvate is formed. In the presence of oxygen, pyruvate enters further stages of cellular respiration, yielding substantially larger amount of energy. During glycolysis, the 6-carbon glucose is split into two 3-carbon molecules of pyruvate. With all the carbon accounted for, no carbon dioxide is released during this stage of cellular respiration. The resulting net energy gain is modest, 2xATP and 2xNADH, since most of the energy is still contained in pyruvate. If molecular oxygen is present, pyruvate undergoes oxidation, and enters the Krebs cycle, followed by oxidative phosphorylation. In the absence of oxygen pyruvate is used as an electron receptor, and undergoes either alcohol, or lactic acid fermentation. First, C02 is released and leaves the cell (note that this is the first time when carbon dioxide is released during respiration). The remaining 2-carbon molecule is oxidized to acetate, and the electrons are carried over to NAD+, forming NADH. In the last reaction, coenzyme A attaches itself to the acetate, and the resulting acetyl CoA, enters the citric acid cycle. The remaining product of pyruvate oxidation is further oxidized in 8 steps of the citric cycle, releasing two molecules of carbon dioxide (note that with the last C02, all the initial carbon atoms of glucose have now been released) and 1 molecule of ATP via SLP per cycle. 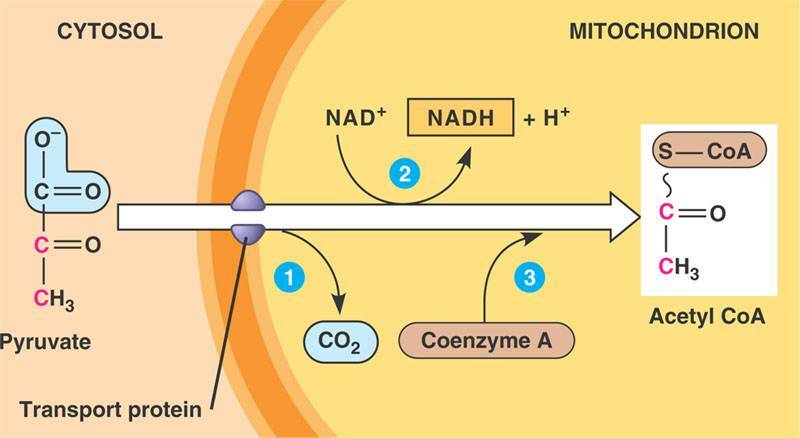 The oxidizing agents in their reduced forms, NADH and FADH2, carry high-energy electrons into the final stage of cellular respiration, the oxidative phosphorylation. A sequence of protein (complexes numbered I through IV) embedded in the inner mitochondrial membrane (as the membrane is convoluted, it provides more surface space for thousands of copies of the chain in each mitochondrion) contain a chain of electron carries of increasing electronegativity, terminated by oxygen, which has the highest affinity for electrons. Electrons supplied by NADH from previous stages of cellular respiration are donated to the first carrier in the chain, the flavoprotein in complex I, while those carried by FADH2, enter the chain from within complex II (FADH2 provides less energy than NADH). The electron carriage becomes reduced as it receives electrons, and return to its oxidized form as it passes them to its next-in-line neighbour, in this case iron-sulphur protein, of higher electronegativity. Electrons then travel through the only non-protein carrier in the chain, ubiquinone (coenzyme Q, CoQ), which lies between complexes I and II (it is also the carries that receives electrons from FADH2 via complex II), and are further up the electronegativity chain, through a sequence of carriers, mostly cytochromes, until they reach oxygen. Each oxygen combines with two protons from the aqueous solution in the mitochondrial matrix, forming water. 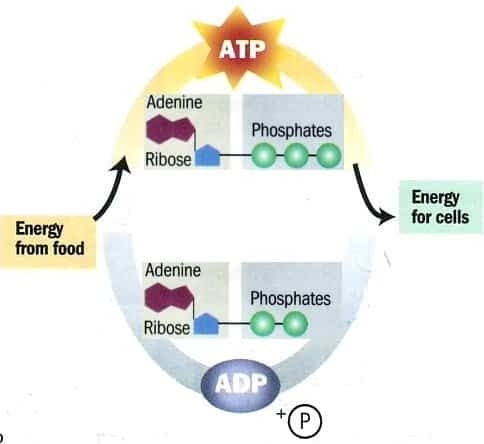 Note that no ATP is generated directly though the electron transport chain. Instead, this stage of respiration builds up a proton gradient needed to the final stage of ATP creation, the chmiosmosis via ATP synthase. Chemiosmosis is a process which uses the energy of proton gradient across a membrane, to power cellular work. The energy supplied by the proton gradient is called a proton-motive force. In cellular respiration, ATP is synthesized by a large protein called ATP synthase, which is powered by chemiosmosis. As the electron transfer chain passes electrons via carriers, complexes I, II, and IV pump protons from the mitochondrial matrix into the intermembrane space, building up the proton gradient across the inner mitochondrial membrane. ATP synthase is the only site though which protons can move back down their gradient. Hydrogen ions enter the stator subunit of ATP synthase, and bind to the rotor subunit. As each proton binds, it causes one rotor’s rotation turn, and detaches, passing into the mitochondrial matrix. Internal rod, another subunit of ATP synthase, respond to the rotation, and its spin causes the catalytic knob subunit to catalyse ADP phosphorylation, forming ATP. In the absence of molecular oxygen, two mechanisms are used to keep up the ATP generation cycle: anaerobic respiration and fermentation. In the anaerobic respiration, the electron chain is used, but the final electron receptor is not oxygen, as in aerobic respiration, but some other electronegative substance (since oxygen is very electronegative, any substitute will be much less effective). Sulfate-reducing marine bacteria, for example, use sulfate ion (SO4^-2) as their terminal electron receptor. As a result, the characteristically smelling hydrogen sulfide (H2S) is produced rather than water. Fermentation does not employ the electron transfer chain, but relies on a continuous ATP generation via substrate-level phosphorylation of glycolysis. 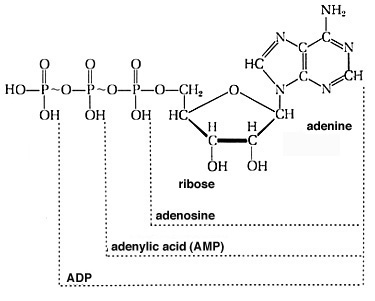 Since glycolysis requires a constant supply of the electron carrier NAD+, a mechanism of recycling NAND from NAD+ is requires to maintain the glycolysis cycle. In order to regenerate NAD+, electrons are transferred to pyruvate, the end product of glycolysis, and the NAD+ can be reused in the continuous glycolysis cycle. The exact end product of pyruvate reduction depend on the kind of fermentation. The two most common types are alcohol and lactic acid fermentation. During the alcohol fermentation, a process characteristic to, for example, yeast, the 3-carbon pyruvate is converted to ethanol in two steps. First, it is converted into a 2-carbon compound acetaldehyde by releasing carbon dioxide. In the second step, acetaldehyde is reduced by NADH to ethanol, and NAD+ is regenerated. During the lactic acid fermentation, carried out by, for example, our muscle in the shortage of oxygen, pyruvate is directly reduced by NADH to lactate (ionised form of lactic acid), with no CO2 formed. The accumulating lactate is gradually carried away to the liver, where it can be converted back into pyruvate, and used in aerobic respiration in liver cells' mitochondria.